What if a giant asteroid strikes Earth? Or a deadly virus spread across the Earth? These events can be occur at any time, and they ocurred in the past, many times. Could Mars save the human race from extinction? Not all of us have to go, we just need to send enough people to sustain a healthy population when something catastrophic happens on earth. But now, the Mars is not a life-friendly place. There’s no food, very little water, and no breathable atmosphere. And the ultraviolet levels are so high that noone can live there without UV protection. In fact, most of organisms including humans would die. We need an Earth-like planet. Mars is also too cold to be like Earth. We are making Earth warmer every year, because of the high CO2 emissions. So, we do know how to make a planet warmer. We can use the same method on Mars: we can increase the CO2 in Mars’ atmosphere. There is frozen CO2 at the poles of Mars. We an release this CO2 to the atmosphere to create a greenhouse effect (1). 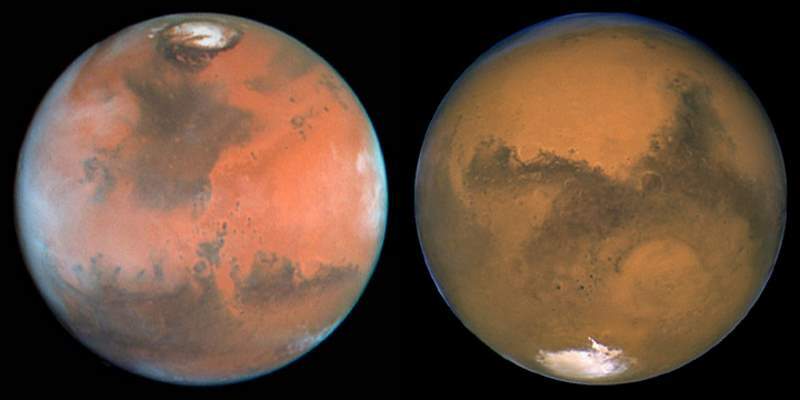 Increasing CO2 levels will not only make Mars warmer, it will also thicken the atmosphere. A thicker atmosphere can block the highly dangerous UV light. So, the microorganisms can survive. Ideally, we would send Cyanobacteria first,(2) They will produce the O2 and O3 (ozone) for the atmosphere. And when these oxygen-producing bacteries dye, their biological matter will enrich the Martian soil. But how we could release the CO2 at the poles into the atmosphere? One crazy suggestion from Elon Musk: “We can nuke the poles.” Another option: we can put giant mirrors into the orbit of Mars which will focus the sunlight, so we can melt down the CO2 at the poles. It will take hundreds, even thousands of years making the Mars a habitable place. We may discover life on Mars. Colonizing Mars, and in general the space researches, improve the quality of life on Earth. An example: NASA’s Hubble Telescope was taking blurry photos in its early years because of an error on its mirror. Astronomers developed a software to correct the images and extract better information from them. This software later helped detecting the breast cancer: the algorithm did a better job than the conventional method, which at the time was the naked eye. Yes, we must try to keep Earth a habitable place. We must slow down the global warming and reverse it back, if possible. Green energy is great. But the Earth has limited resources, and even with a huge recycling, they won’t last forever, especially the metals. So, we must find new resources, and that’s why the colonization of the other planets and satellites is really important. The greenhouse effect is the process by which radiation from a planet’s atmosphere warms the planet’s surface to a temperature above what it would be without its atmosphere. If a planet’s atmosphere contains radiatively active gases (i.e., greenhouse gases, Water vapor (H2O), Carbon dioxide (CO2), Methane (CH4), Nitrous oxide (N2O), Ozone (O3) and Chlorofluorocarbons -CFCs-) the atmosphere will radiate energy in all directions. Part of this radiation is directed towards the surface, warming it. The downward component of this radiation – that is, the strength of the greenhouse effect – will depend on the atmosphere’s temperature and on the amount of greenhouse gases that the atmosphere contains. Cyanobacteria also known as Cyanophyta, is a phylum of bacteria that obtain their energy through photosynthesis. The name “cyanobacteria” comes from the color of the bacteria (Greek: κυανός (kyanós) = blue).By producing gaseous oxygen as a byproduct of photosynthesis, cyanobacteria are thought to have converted the early reducing atmosphere into an oxidizing one, causing the “rusting of the Earth” and causing the Great Oxygenation Event, dramatically changing the composition of life forms on Earth by stimulating biodiversity and leading to the near-extinction of anaerobic organisms (that is, oxygen-intolerant). Symbiogenesis argues that the chloroplasts found in plants and eukaryotic algae evolved from cyanobacterial ancestors via endosymbiosis.